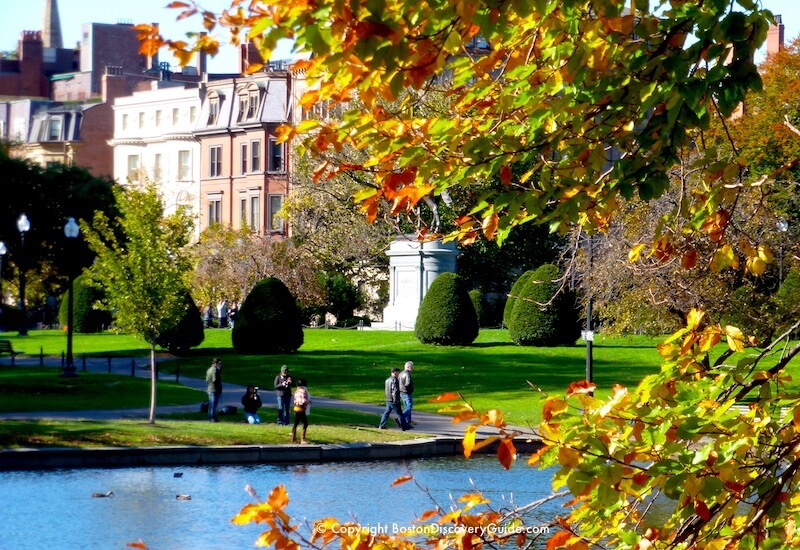 Spectacular Boston fall weather makes October an ideal month to visit the city. The muggy days of summer are a distant memory, and we pretend the first snow flakes are many months away. 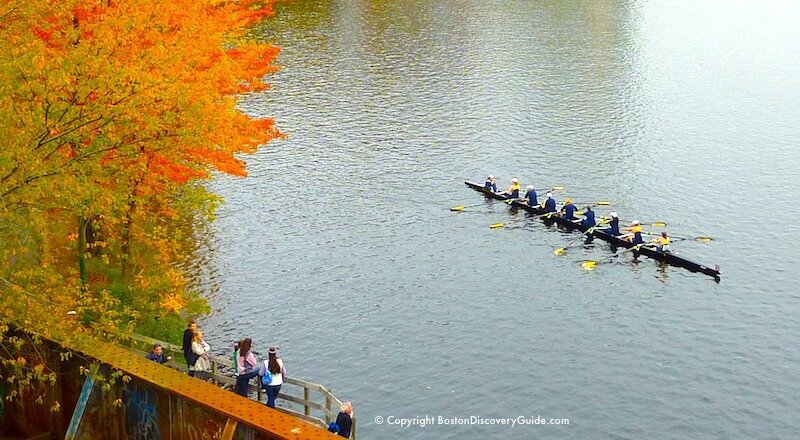 Gorgeous crimson and gold fall foliage puts on a show throughout October. 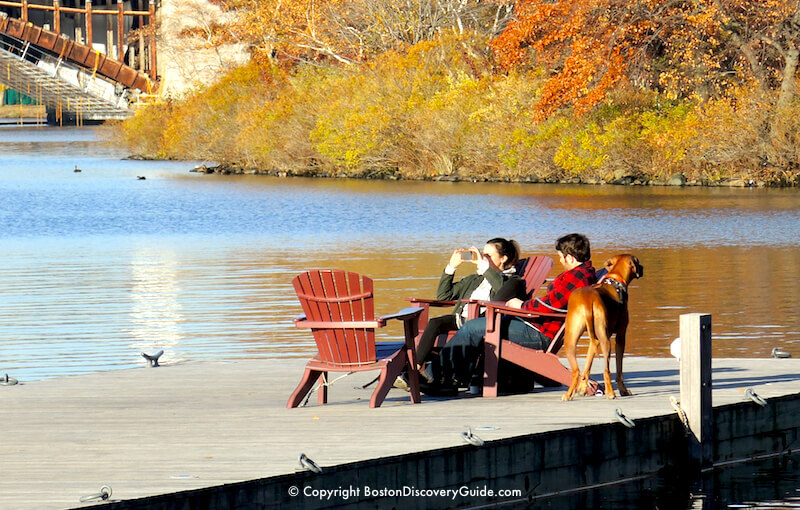 If you're visiting this month, head outdoors, soak up the sun, and enjoy the pleasures of fall in New England! 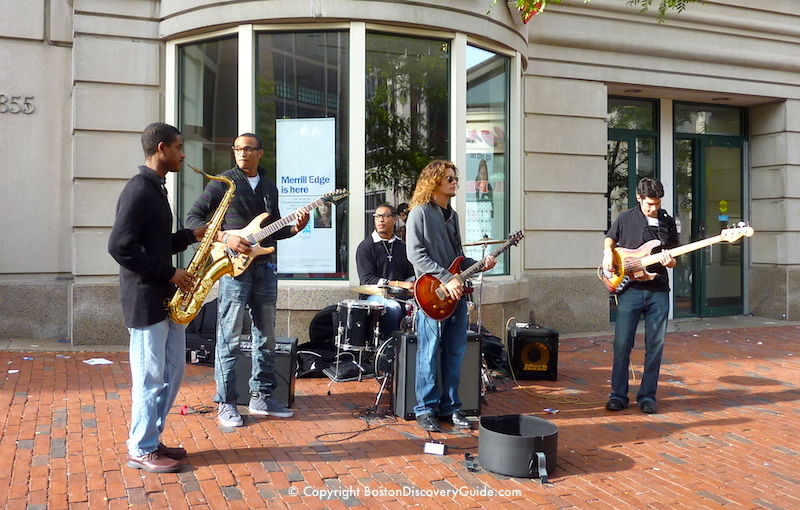 Want to get a sense of what Boston weather is like during October? Take a look at the photos on this page - you'll see how fanastic being outdoors in October can be! To be fair, we also get rain but it usually doesn't last long. The temperature may be chilly, but not usually cold. On the very rare occasions that any snow falls, it melts quickly because the ground is still warm. Want to soak up sunshine while enjoying a meal? Restaurants still have tables out during October. Even though not every day will be warm enough for al fresco dining, don't pass up this warm-weather pleasure when the temperature cooperates. Walk down Newbury Street in Boston's Back Bay neighborhood, and you're sure to find plenty of appealing outdoor dining venues. 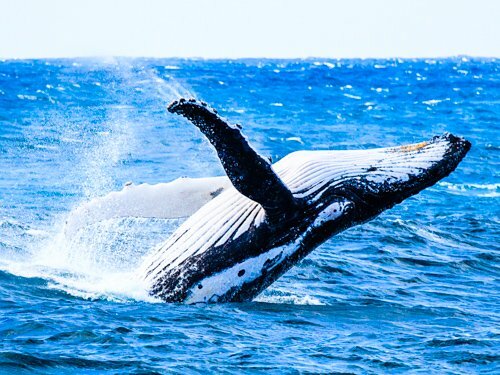 Another outdoor dining option for warmer October days is to join one of the popular lunch, brunch, or dinner cruises (more dinner cruise information). 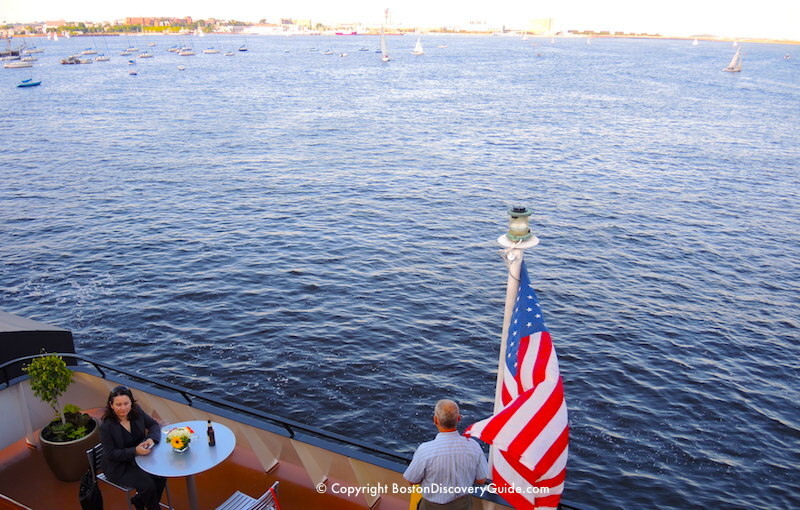 Enjoy sunshine on the deck as you watch the city skyline fade into the distance as your ship tours Boston Harbor. You'll see famous sites such as the Bunker Hill Monument, the lively South Boston Waterfront, and finally the Harbor Islands. 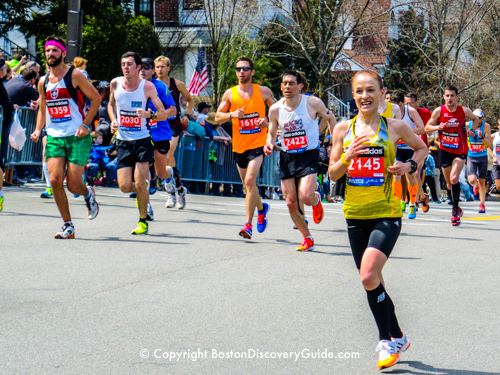 Not every Boston day in October is warm. 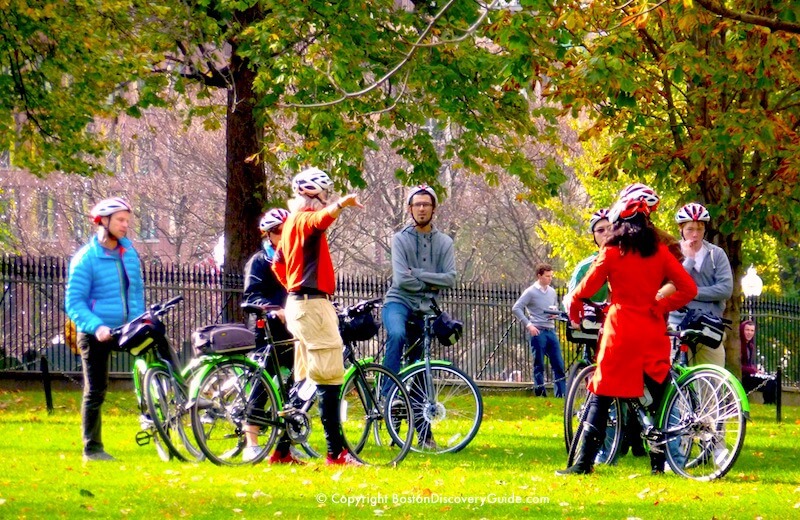 As you can see, this bike tour group dressed for chilly weather. Despite all the green grass and barely turning foliage, this photo was actually taken in late October, when many leaves had already fallen (you can see glimpses of bare branches in the background). 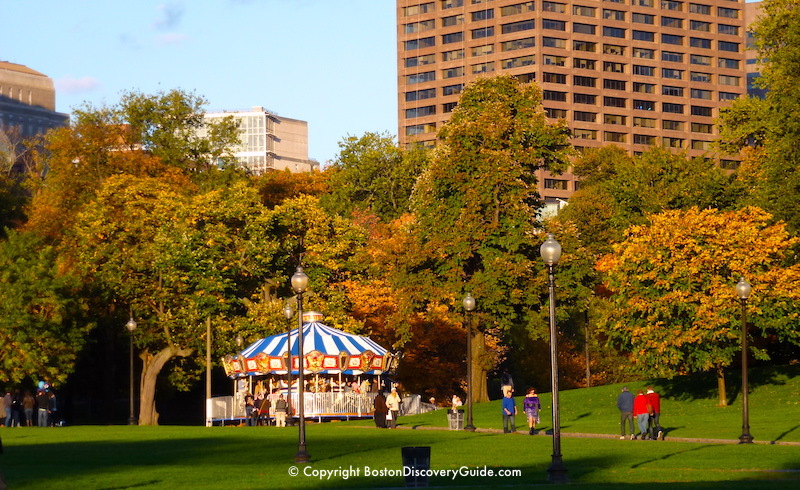 The carousel on Boston Common continues to entertain kids of all ages throughout October, with lots of people strolling along the nearby paths and enjoying the beautiful weather. Although the leaves on the surrounding trees are beginning to turn gold and crimson, the majority are still green. 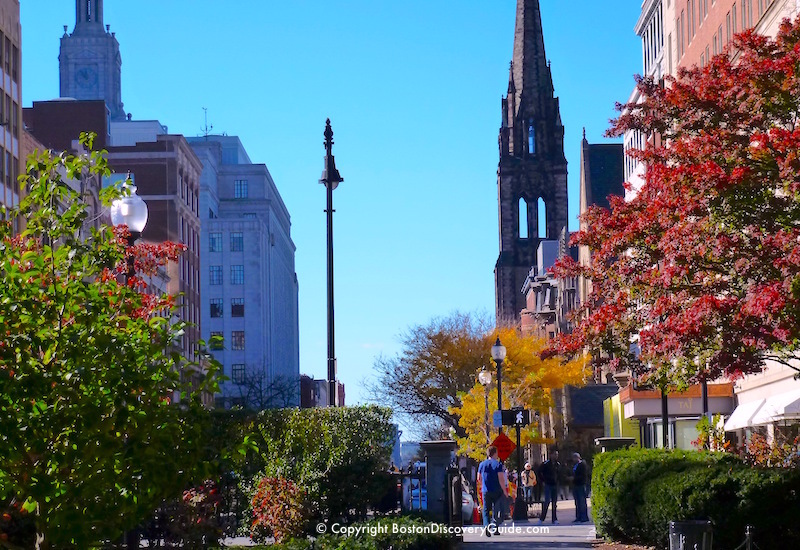 Stroll along the Rose Kennedy Greenway, the long winding park near the waterfront, and you'll see a huge variety of trees and interesting plants showing October fall color. 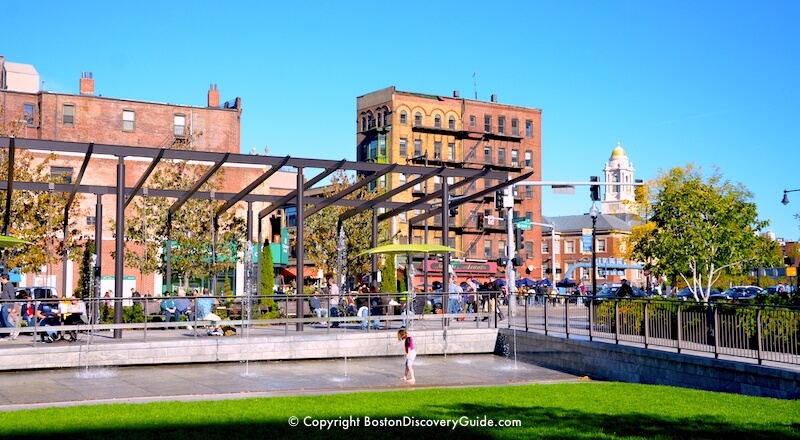 Sit at one of the tables or on the grass and have a picnic - you can buy food at one of the North End's many wonderful bakeries, or at Boston Public Market on the other side of the Greenway near Faneuil Marketplace. October weather in Boston includes plenty of balmy days, usually some rain, and occasionally the first significant snowfall of the year. As you can see, the record high temperature for October is . . . pretty high. Even though that's the extreme, we typically get temperatures in the 70s° and even low 80s° - which makes October a great month for outdoor activities. About the possibility of snow . . . it's unusual, but does happen. In the city, snow melts quickly at this time of the year because the ground is still warm, so you probably won't experience any real inconvenience. However, do check the Boston weather forecast before coming to Boston so that you'll know what to expect. If the Weather Turns Cold or Rainy . . . 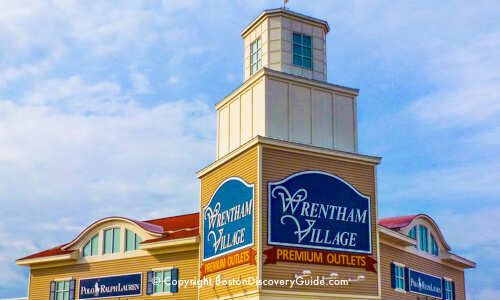 In addition to our regular suggestions about what to pack for your Boston trip, be sure to bring plenty of layers - sweaters, a light jacket, maybe a warm vest, rainproof gear - so that you'll be ready for whatever Boston weather in October comes your way. If you checked the weather chart above, you saw the record high for October: 90° F. Yes, that's unusual - that's why it's a record - but keep in mind that temperaturs almost that high are not unusual during this month. So bring at least one outfit suitable for summer-like weather, and then plan to add layers if the temperature drops. Particularly if you're visiting Boston toward the end of the month, pack a warm jacket, gloves, a hat, and scarf. Boots are a plus - but also add sandals or flip-flops for the balmy days. Raingear is always beneficial. 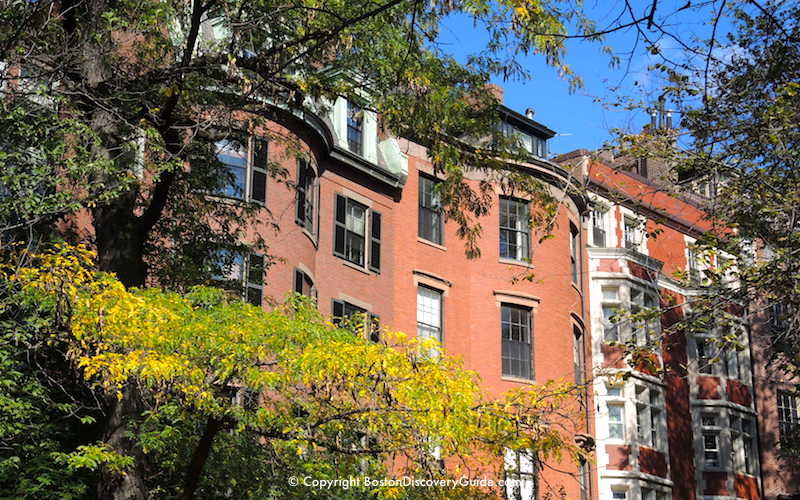 If you want to create your own walking tour, October is a great month to explore Beacon Hill, where golden-hued foliage forms a canopies over the narrow streets lined with early 19th century Federal rowhouses and Victorian mansions. Many Boston visitors know the Esplanade as the site of the big Independence Day celebration on July 4th, but don't think about visiting it during other times of the year. That's a mistake. Not only is the Esplanade where you can see gorgeous flowering trees in bloom all spring and enjoy free concerts and movies during the summer, but in fall, it's the perfect place to enjoy beautiful October weather and autumn foliage colors. More about Boston Weather - Average monthly temperatures and precipitation - plus a lot more info!